Tell us about Hidden Daylight! Hidden Daylight is a short suspense thriller about a businessman trying to find his wife, who was abducted by a notorious serial killer. 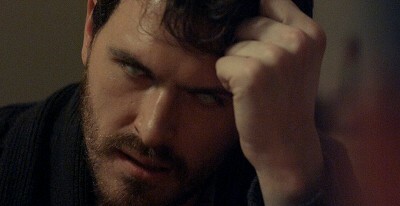 The businessman consults a psychic who can see through the killer's eyes. I wrote the film as a sort of calling card to enter into the horror genre as a writer. Has there been a good deal of publicity for this project and have critics been favorable? Yes! We have played some very big festivals (Shriekfest, Dances With Films, etc.) and gotten lots of really good press. Knock on wood, all the reviews that I've seen so far have been positive. Do you have any interesting stories revolving around Hidden Daylight? The shoot went pretty smoothly, but a couple stories come to mind. We had to construct a "lair" for the serial killer that involved lots of photographs, print clippings, drawings, etc., that depicted some fairly graphic and messed up things. After we wrapped, since we live in NYC, we didn't have anywhere to put this stuff aside from our building's communal trash room. I remember shoving all of this terrifying material into a tiny compactor room in a building in Manhattan and hoping no one stumbled on it and called the cops. Also, we were dealing with some sound issues because there was a group of Dominican ladies listening to really intense merengue music in the apartment next door. Our lead actor David Rey is a very handsome man, and we convinced him to undo some of the buttons on his shirt and go next door to smooth talk them -- and it worked! The ladies took a picture with David and turned the music down. These are the things you have to do to get a movie done on a teeny budget! Does your company have a web page? We do! You can find us at www.ManOfTheCrowdProductions.com, and you can also visit our sister production company which co-produced Hidden Daylight at www.TheGarageProductions.com. Do you have any follow up or future project you are planning? Oh, yes! We have a feature film called The Dark Room in development, which is a more traditional horror film that won the New Blood Award for screenwriting in 2015, and I'm also working on a horror/drama TV series called The Believers Club, which should be ready to go by early next year. Did you study drama or film making in school or pick things up on your own? I studied Theatre and Creative Writing at Fordham University. I have to admit, however, that the most practical knowledge came from hands-on experience and simply putting my work out there. There is no better teacher than experience, and I have been fortunate to work on great sets with some great companies, at all budget levels. Perhaps you could give is a little background info on your life and career? Sure! I'm originally from Pittsburgh, Pennsylvania. My mother was a florist and my father was an electrical engineer, so I inherited an appreciation for both the creative and the practical early on. 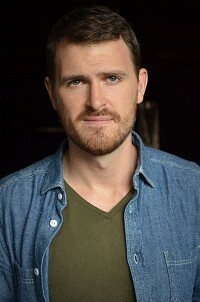 I have been writing and acting for as long as I can remember, starting in my church drama group and continuing throughout high school and college, when I moved to New York City. My focus was being a performer when I graduated, so I did a lot of stage work before transitioning into TV and film. There is currently a huge impetus for actors to create their own work, so that's exactly what I did... and remembered how much I love writing as well! The two have gone hand-in-hand for me ever since. Do you hope to go from shorts to feature films? Funny enough, I had already worked on a couple of feature films before I did Hidden Daylight. Of course short films can be important stepping stones for getting features made, but I think of them more as their own art form. Short films aren't just for beginners. They are a unique type of storytelling with its own challenges and rewards, and I hope to continue to do both in my career. Was making a transition from writer to producer difficult? I wouldn't say difficult so much as necessary. When you are just starting out, producing your own work is key because you need exposure. I have always been creative in many different areas, so wearing lots of hats isn't new to me. But I do have a newfound appreciation for producers, who have an incredibly nuanced and complicated job. Which do you prefer out of the two areas? Definitely writing. I am much more of a creative mind. Are you planning to show your latest film at any upcoming festivals or fan events? Our festival run just ended, but we were fortunate enough to get a distribution deal with Shorts TV, the world�s only 24/7 HD channel for short movies. 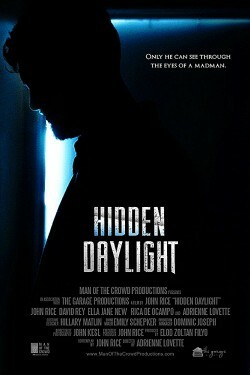 Hidden Daylight will be available to view soon on DIRECTV and a variety of other cable and streaming platforms. What realm or genre do you prefer, if any, be it horror or mystery as your short seems a mix of both? The thing that appeals to me the most about the dark genres is their ability to showcase the ambiguities of the world, the gray areas, the things that aren't talked about in ordinary life. I love the horror genre, but since my writing tends to be very character and plot-focused, my horror stories usually turn into unintentional thrillers and mysteries. Is there anything else you would like to throw in for this interview, as we are keeping it short and to the point? Just... If you have a story to tell, get out there and tell it, whatever way you can! Thanks for supporting indie filmmakers!